The island of Puerto Rico is the smallest of the Greater Antilles (Cuba, Hispaniola, Jamaica, Puerto Rico). Situated ca. 18 degrees North, Puerto Rico has a subtropical, frost-free climate, with an annual temperature range of ca. 20° - 35°C. 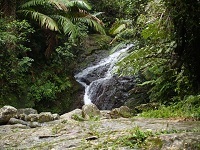 The natural vegetation is mesic subtropical forest, with dry forests in the southern lowlands and rain forest in the higher mountainous areas. The Cordillera Central mountain chain, of volcanic origin, reaches 1338 m. Along the north portion of the Island is an extensive Karst formation. Serpentine outcrops occur in the southwest. The Sierra Bermeja in the southwest corner of the Island is composed largely of Jurassic chert with some serpentine outcrops. According to Axelrod 2011, around 2912 species of vascular plants have been reported, in 1057 genera and 210 families. Of these taxa 2337 (80%) are native and 575 (19%) are exotic; of the native ones, 243 (10%) are endemic. Much of the natural vegetation was cleared by the turn of the beginning of the 20th century. While extensive reforestation has been ongoing, intense population pressure (c.3.7 million people in an area of c.9000 km²) has resulted in major loss of critical habitats. There are a number of federal, commonwealth and private reserves on the island, comprising c.7% of the total area . The MAPR Herbarium, with some 37,000 specimens, is situated on the west coast of Puerto Rico, in the Biology Department of the University of Puerto Rico-Mayagüez Campus. The herbarium, founded in 1958, has collections from throughout Puerto Rico, and from Cuba and Hispaniola. It is especially rich in collections from western Puerto Rico and the islands of the Mona Passage (Desecheo, Mona and Monito), Caja de Muertos and Vieques. Collections include material from other areas worldwide acquired through loans or collecting trips. The Herbarium also holds fungi, lichens and some fresh water algae collections. Bryophytes are well represented at MAPR including collections from most of Latin America. All the vascular plants have been databased, and the bryophytes and the fungi are in the process of being incorporated into the database. For the bryophyte collections, please see our published site at: http://herbaria.plants.ox.ac.uk/bol/MAPRBRYO. The MAPR Herbarium is also an Institutional Member of the Red de Herbarios de Mesoamérica y el Caribe and is a participating partner of the Global Plant Initiative. - 5-year revision of 12 threatened and endangered plant species as listed by the USFWS. - Digitalization of the MAPR Herbarium Types through the GPI Project. - Revision of the list of vascular plants species for the Puerto Rican Endangered Plants Initiative. The BRAHMS database has been in use at the MAPR Herbarium since 1998. With the support from the Biology Department, US Fish and Wildlife Service and International Institute of Tropical Forestry, data have been captured from over 56,000 specimens held at MAPR and other major Herbaria in Puerto Rico, the United States and Europe. Apart from general curatorial work, BRAHMS is being used to publish checklists and floras of various reserves in PR and also to map out the distribution of rare and endangered species. We are in the process of imaging our specimens and those of certain other herbaria. Over 15,000 images are now linked to specimens in BRAHMS. We are currently geo-referencing MAPR specimens for more accurate mapping. Specimen coordinates are geo-referenced following the 2006 edition of the "Guide to best practices for georeferencing" provided by the Global Biodiversity Information Facility. Specimen locality coordinates (Puerto Rico Datum) are provided in decimal degrees with a precision of 5 decimal places. Further questions regarding the georeferencing of our specimens can be addressed to J. Danilo Chinea. These data may only be used for scientific purposes. They may not be sold or used for commercial purposes. MAPR is willing to exchange material. We are particularly interested in enhancing our collections from central and eastern PR, other Antillean Islands and cultivated plants. MAPR has received support from a number of sources. Databasing and evaluation of species distributions has been funded through the International Institute of Tropical Forestry and the US Fish and Wildlife Service. In 2006, MAPR was awarded a two year National Science Foundation (NSF) grant titled: Upgrading and Internet Publication of the Herbarium of the Department of Biology at the University of Puerto Rico, Mayagüez.